Smoky chorizo sausage with baby new potatoes and fresh red peppers, all packed into a crunchy corn tortilla shell on a crisp bed of fresh baby leaf spinach. Boil the potatoes in lightly salted boiling water for 15-20 minutes until just tender. Drain and leave to cool slightly. Cut into chunky slices. Dry fry the chorizo in a non-stick frying pan over a moderate heat for 3-4 minutes, until crispy. Throw in the crunchy peppers and new potatoes and cook for 2 minutes, then stir in the Garlic & Paprika seasoning mix. Leave to sizzle for 2-3 minutes until the chorizo, peppers and new potatoes all have a good coating of seasoning mix. 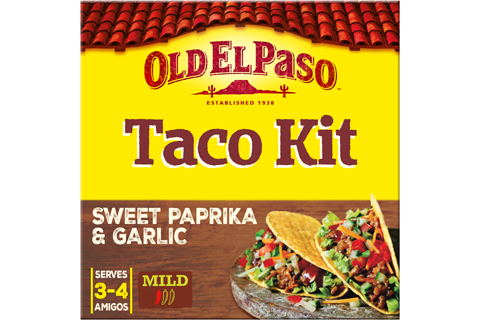 Warm the crunchy Corn Tortilla Shells following the instructions on the box. Round up your amigos and grab the taco shells. 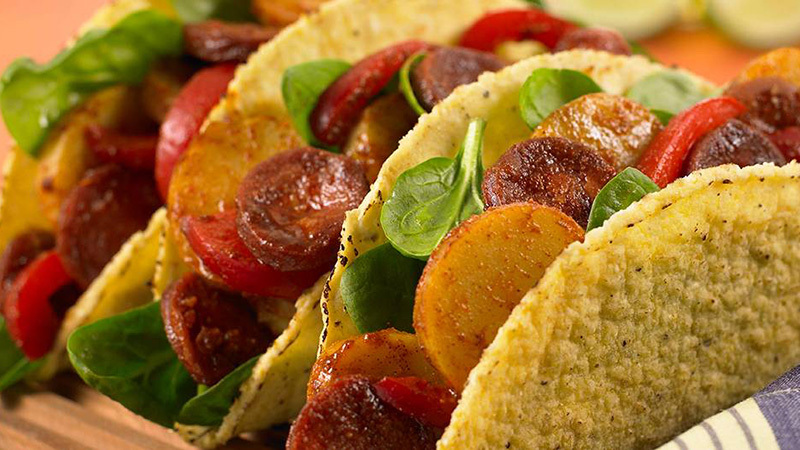 Our taco shells are twice baked so they're extra crunchy and you can load your chorizo tacos up with plenty of potato and salad. Share them round and dig in!